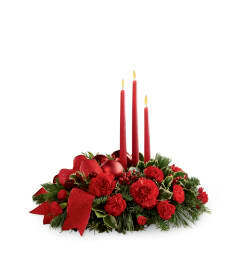 FTD® proudly presents the Festive Holiday™ Bouquet by Vera Wang. 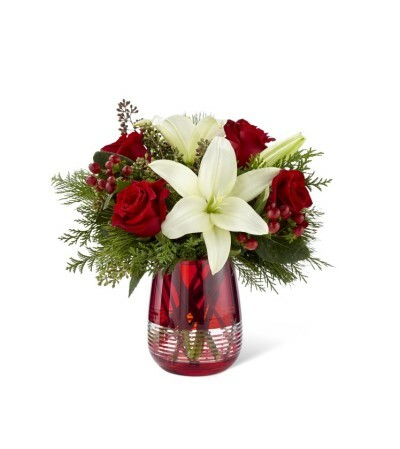 Blooming with the glamour and elegance of this festive holiday season, this stunning Christmas bouquet has been conceived of by none other than style icon Vera Wang. White Asiatic Lilies pop against a crimson background of rich red roses, beautifully accented with red hypericum berries, seeded eucalyptus, and an assortment of fragrant holiday greens. 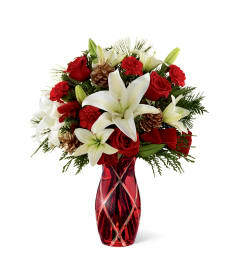 Presented in a chic and modern red glass vase with a striped, clear embellishment at the bottom, this fresh flower bouquet has been created just for you to send your warmest season's greetings in style.